Legume Best Management Practice in the Brigalow Belt Bio-Region project aims to improve the productivity, profitability and sustainability of beef enterprises through reliable and successful use of pasture legumes. This will be achieved through coordinated research and extension to improve the knowledge and skills of graziers and industry advisors in using pasture legumes. Figure 1. Cattle grazing on a productive buffel grass and Caatinga stylo pasture in central Queensland. The Brigalow Belt is a critically important region for beef production in northern Australia. 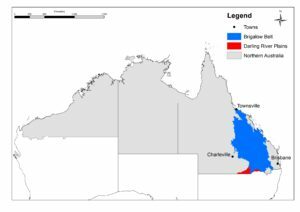 This region carries a high proportion (>30%) of the northern Australian beef cattle herd on 15% of the grazed land area and supports high animal performance (reproduction and growth rates). Such carrying capacities are largely possible due to the extensive areas of sown pastures growing on relatively fertile soils with moderate rainfall. Pasture legumes have been identified as the best long-term option to increase the productivity and returns from both sown grass pastures and native pastures across the Brigalow Belt. 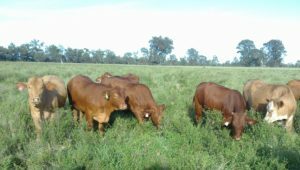 On-farm research studies in central Queensland (Wandoan to Capella) reported a 60-160% increase in live weight gain per hectare and a doubling of gross margins with legumes (leucaena and butterfly pea) compared to grass only pastures (Bowen et al. 2015). On-farm research sites in buffel grass pastures recorded a 40-100% increase in annual pasture production (dry matter per hectare) with legumes (Caatinga stylo near Moura; desmanthus near Wandoan) compared to grass only pastures approximately 15 years after establishment on low phosphorus soils (Peck et al. 2013). These grass/legume pastures also responded strongly to phosphorus fertiliser application with an additional 50% increase in kilograms of dry matter per hectare. 10-30% increases in pasture production have been reported with native pastures augmented with legumes (McIvor and Gardener 1995). Stylos in native pastures have recorded 30-60 kg per head per year of live weight gain benefits (Hall et al. 2004). Despite impressive results from legumes in trials and some commercial pastures, adoption levels remain low in the Brigalow Belt. Leucaena is one such example. Leucaena is one of the most widely grown pasture legumes, however it has only been successfully adopted on about 3% of the area of pasture land that it is adapted to in Queensland (Peck et al. 2011; Beutel et al. 2018). These low successful adoption rates mean there is a huge opportunity to increase beef production, and potentially enterprise profitability, for decades to come. This project consists of an integrated suite of participatory research, development and extension activities which will bring together the knowledge and experience of scientists, graziers and advisers. Development and extension activities will utilise past research to help graziers to establish and manage pasture legumes to increase productivity and resilience on their own farms. At the same time, research with pasture legumes will confirm the most persistent and productive varieties, further develop practical ways to establish legumes into existing grass-only pastures and increase the productivity of the pastures through fertiliser application. Extension and testing legume options with industry, which will be achieved by engaging with 20 grazier groups in workshops or field days, followed by 40-60 on-farm demonstrations and eight detailed on-farm trials testing legume varieties, establishment methods and long-term management. Persistence and comparative productivity trials of commercially available legume varieties to be conducted on six sites. Nutritional requirement of legumes during establishment and early growth as trialled on two sites. Research on methods of establishing legumes into existing grass pastures at five sites. Legume Best Management Practice in the Brigalow Belt Bio-Region is a five-year project to be completed in 2022. This project has been jointly funded by Department of Agriculture and Fisheries, Queensland Government and Meat & Livestock Australia. Bowen, M, Buck, S, Chudleigh, F (2015) ‘Feeding forages in the Fitzroy: A guide to profitable beef production in the Fitzroy river catchment.’ (Department of Agriculture and Fisheries, Queensland. McIvor, JG, Gardener, CJ (1995) Pasture Management in semi-arid tropical woodlands – effects on herbage yields and botanical composition. Australian Journal of Experimental Agriculture 35, 705-715. Peck, GA, Buck, SR, Hoffman, A, Holloway, C, Johnson, B, Lawrence, DN, Paton, CJ (2011) Review of productivity decline in sown grass pastures. Meat and Livestock Australia No. 9781741916416, Sydney. Available at https://www.mla.com.au/research-and-development/search-rd-reports/final-report-details/Productivity-On-Farm/Review-of-Productivity-Decline-in-Sown-Grass-Pastures/431.